PRS Guitars have earned their place in history by pushing the boundaries of modern build technology, while honoring the rich past of the instruments that came before them. 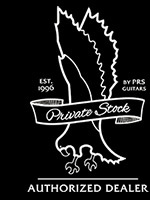 Based in Stevensville, Maryland and founded by master luthier Paul Reed Smith in 1985; PRS Guitars quickly gained popularity with artists such as Carlos Santana, Howard Leese, and Derek St. Holmes, noting the exceptional build quality and unique marriage of popular features found on instruments at the time. Paul Reed Smith, himself, has always been a dreamer, a rebel, and a relentless taskmaster; pursuing perfection in regards to both build quality and tone. PRS guitars have time and time again captured the imaginations of guitarists, while constantly striving for perfection in playability, new breathtaking finishes, unwavering consistency, and gig worthy designs that instantly feel like home. Paul Reed Smith instruments are more than just guitars; they’re astonishing works of art. Every new 10 Top, Artist Package, and Private Stock instrument you see here has been hand selected by our staff, representing what we feel are some of the finest examples of each model. Wildwood Guitars is proud to present our exceptional selection of PRS guitars; some of the most consistent, breathtakingly beautiful instruments we’ve had the privilege of carrying. The entire Wildwood Staff invites you to experience the uniquely vivid, unmistakable modern brilliance of a PRS guitar.